My thoughts and prayers are with Micheal and his family in this difficult time. Keep fighting and good luck with your recuperation Schumi, you'll win it. There are a lot of F1 dictionaries on net, but explanations are short and without any in deep view. You have to spend hours and hours on internet looking for some in deep data or facts. For example check f1-country.com or Official F1 site, and you will understand what I’m talking about. On other side is f1technical.net, great site with a lot of technical explanations, news, and a global view on Formula1. But again, dictionary with very short explanations. Anyway, you can learn a great deal of F1 from this site. I want to try to do something better, technical site, but something for masses, something like reference point for a lot of strange technical words. I tried to do something like this on f1network.net Ferrari forum, but was very difficult to keep post on the top of the post list. It was not an ideal thing, so I decided to try to make my own site. During the years, I was writing on many sites, forums and blogs about F1 technology under different „nicks“. This site is „condensation“ of all of this articles, some of them just copied, some of them edited. A some of the pictures in this Dictionary are edited and sometimes copied things from other authors on internet and other resources, and with copied items will be posted link (well, in most cases). But most of items are my originals. BTW, this site is not created for any monetary gain. Hello! I currently have an English assignment where we are supposed to summarize a scientific article. I chose your article about blown diffusers. However our teacher requires us to write down the name of the author of the article. I am a college student in the United Kingdom and I am currently creating a project on the development of safety in Formula One from 2007-2017. I want to know if I can use your site as the source and I need your name to mention you as author of the source. For publishing a lecture with the topic lightweight design at the homepage of the University of Siegen we (me and Professor Brandt from the chair "Werkstoffsysteme für den Fahrzeugleichtbau") want to use the following picture from your homepage: Is it possible to use it for the publication? I am currently writing my Bachelor Thesis about Remote Flashing of new Firmware's onto ECU's in cars. And I would like to use your page about ECU's http://www.formula1-dictionary.net/ecu.html as reference when talking about Formula One cars. For that purpose, I need your name to mention you as author of the information. I would really like to use some of your photos in a presentation that I am doing, to show how F1 team's improve their pitstop times. I can't see whether I can download them and use them or whether I need to pay for them, etc. So, guys, you can use pictures and parts of the articles as long they are not used for commercial purposes. Basically, you can't make money with them. I'm doing this entire job for free, no money earned, no commercials. So why would you. BUT IF YOU DO, I WANT AT LEAST A PART OF IT!!! I'M JOKING!! NOT, I CAN USE SOME EXTRA!!! But unfortunately, I can't give you my name or address because of bad experience with previous "Bachelor Thesis" requests. Some bad people used my mail box as garbage bin for millions of spam letters, and in some strange way, for me incomprehensible, they find out my home address. Bad memories. But you can use my site address, site mail and my nick "SEAS" as reference. If there are some questions, do not hesitate to mail me. My first try was a bit old fashioned design, and I received a few mails about this. This is my third try, and again, only design of pages is changed. I know it’s still not a perfect, but I will try to improve it with time. I will add items from time to time, so come here and check it out. Items will be added with time, depend on my free time. I have a family and other jobs, you know! Formula 1 racing is all about passion. It’s sometimes weird sport, often twisted, but magnificent all the time. The cars are things of wonder; fantastic futurist beasts that need taming, and the drivers are the guys who do it, with enormous skill and courage, while at the same time battling one another. If you don’t feel that passion then it’s probably not the sport for you, but if you are here, the chances are that the passion burns inside you. I’m a Ferrari fan, but this site is not biased in any way. This is a site about Formula 1 and racing technology, and there, all teams are involved. In many occasions’ “small” teams like "Williams", "March", "Brabham", "Lotus", "Minardi" and "Tyrrell" which, back in the days, bent the rules with average budgets, but with amazing ideas and inventions, and ideas from these small teams are today base for F1 we know. It always amaze me what those teams can do with budget they have. Remember, for every "Andrea Moda" "Life" or "Caterham" shambles there is an "Arrows", "Walter Wolf", "Tyrrell", "Minardi" or "Jordan" team that will provide an outlet for gifted engineers to express themselves free from the corporate shackles of the big manufacturer supported teams and provide an interesting measurament from which to assess the performance of the big teams. If you find something on this site you think is biased, you have to know that this site is only mine, is not sponsored by anybody and basically I don’t care. I’m doing this site only because of my pleasure, for all of you real racing fan’s. Few avatars doesn’t make site biased. On this site technical data are more important. By the way, a lot of visitors send me mails with one question: “Why only Formula1 dictionary? Why not racing dictionary?” OK, I will try to expand the site. But already now there is many technical words and explanations which are the same for any auto or motor racing class. And one more thing. English is not my „mother language“. So be tolerant. There may be some misspelling or „pidgin English“, but I'm doing my best. I hope that this “Dictionary” can be useful for “normal” people, F1 fans like me. "In F1, the first person you have to beat is your team-mate"
Moses Solana (BRM P57) No 13, 1963 Mexican Grand Prix. Mexico City, 11th position, retired. Unlucky No.13 is a very unusual starting number and the FIA and several other race organizers conspicuously avoid appointment of the number. 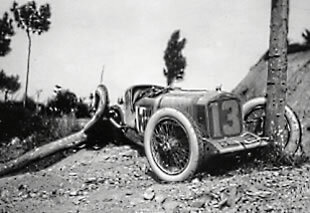 In fact, the history of excluding No.13 as an entry number goes back to 1925 when Paul Torchy was killed and 1926, when Giulio Masetti died in a Maserati carrying the No.13 when taking part in the Targa Florio. Since then, the number is not issued by organizers of motorsport events, even though a driver has the right to request it. 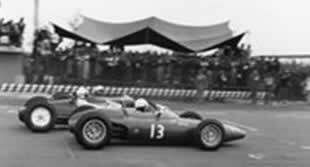 In fact only twice before in F1's six-decade history has a car carried the number: Moises Solana (picture left down), who retired, at the 1963 Mexican GP and Divina Galica when entering the British Shellsport International Group 8 series driving a Surtees TS16 Formula One car. Galica did manage to take third place at the Brands Hatch and second place at the Donington Park rounds. Galica also failed to qualify for the 1976 British GP carrying number 13. And then, a new FIA regulation introduced from 2014 onwards is for drivers to have permanent number throughout their careers, with numbers 2 to 99 available with number 1 reserved for the defending World Champion, if he wants to use it. And Lotus's Pastor Maldonado has elected to bring the number 13 back to Formula 1, even though not normally used due to its association with poor luck. Let’s hope the number proves luckier for Maldonado who says it has a long history in Venezuelan sport. The 2014 season brings with it the biggest revisions to the Formula One technical regulations I can remember. Here is a short list of most important changes, and how 2014 rules compare with rules in action during 2013 Formula 1 season. The new rules have presented a huge challenge for the teams and engine manufacturers. Almost every single part of the car is a new design, from the front wing right back to the diffuser. It's been a massive job to accommodate all the changes of the power unit, especially new cooling requirements of the power unit, and what is the best way to optimize it in the chassis. So, let's se it. In 2014 engine changed name in "power unit" and they have to be 1.6 litre V6 boosted with a turbocharger and greater energy recovery systems. They can boost around 600HP (without ERS, prediction for the beginning of the season) at up to 15,000rpm. The power unit is fuel flow restricted. They have new direct injection into cylinders, with fuel pressure at 500 bars. Teams have just five power units/car/season and each has to last 4000km. In 2013 the engines were 2.4 litre V8s with fuel indirect injection. In 2013 engines produced around 750HP at up to 18,000rpm. 2013 teams had eight engines/season/car and engine units had to last 2000kms. In 2014 gearboxes have eight forward gear ratios plus reverse gear. Each team must nominate all ratios ahead of the season. In 2013 gearboxes had seven gear ratios plus reverse gear. In 2014 teams have to manage with total load of 100kg of fuel, and fuel flow is restricted to 100 l/hour at more then 12.000RPM-s. In 2013 teams weren't limited to a fuel weight or flow, though typically they'd have 160kg on board at start of the race. In 2014 new exhaust rule mandate a single tailpipe of fixed dimensions, which must exit 170-185mm behind the rear axle line and 350-500mm above the floor. Circular end of the final 150mm of tailpipe to point upwards at an angle of five degrees. Exhaust can be offset from the car's centre-line by 100mm, which could allow the retention of the monkey seat winglet. Any bodywork in the area behind the tailpipe's axis is also banned, preventing vanes or winglets from diverting the plume towards the rear wing or diffuser. For 2016, FIA added one or two additional exhaust pipes to be used only for westegate gases. In 2013 you could have two exhaust pipes on each side of the car which could be directed over the rear bodywork (blowing effect). In 2014 ERS can harvest energy from two sources - kinetic energy from braking, ERS-K, and heat energy ERS-H fitted on turbocharger. ERS can deliver 160HP and is available for around 30 seconds/lap. In 2013 KERS energy harvesting was done using only brake energy to drive a generator. Harvested energy was good for around 6-7 seconds a lap delivering 80HP. In 2014 electronic rear brake control system is allowed to prevent strange behavior of the brakes during harvesting this much energy under braking, compensating for the need for the driver to constantly alter the brake bias. In 2013 drivers was allowed to adjust the brake bias only manually to change the KERS harvesting. In 2014 lower rear beam wings below the main rear wing are gone. Rear wing main flap is slightly shallower in profile, because flap area is now reduced from 220 to 200mm. Also position of camera and dummy camera support are tightly regulated. In 2013 teams used beam wings. Rear wing flap area was 220 mm. Camera and dummy camera support was used for aerodynamic advantage. In 2014 front wings are narrower with wide of only 1650 mm. In 2013 were 1800mm wide. In 2014 for safety reasons (to prevent disastrous t-bone or nose-to-wheel crashes, to reduce the likelihood of cars launching in the air in case of a front to rear impact, and also to reduces the risk of a driver sustaining head injuries, which could happen with the previous higher nose design) nose cone tip height of cars is a much lover at 185mm from reference plane. Height of the forward bulkhead is reduced to 525mm. In 2013 the nose height was 550mm from reference plane. Height of the forward bulkhead was 550mm. In 2014 to compensate for the increased weight of the new power unit with heavy energy recovery systems incorporated, car weight is increased to 690kg. In 2013 a car weighed 642 kg. In 2014, following 2013 tire problems, the FIA has inserted a line into the regulations that allows it to change the tire specification without notice or delay. in 2013 for this decission was necessary to have mayority vote of all F1 teams. In 2014 a new side impact structure is introduced. Following a project lead by the FIA Institute and the teams, more resistant structure to angled side impacts is developed, which might previously have been torn off. In 2013 old side impact structure was in use. It was noticed that with strange impact angles structure can be torn off. For 2017 we have big aero changes. Wider cars, wider tires, different body and wings shape. Engine side is mostly unchanged, except there is no more Engine tokens, so development of the engines is free but limited by number of available engines trough the year. For year 2018 rules are stabile. The bigest change is addition of FIA-driven mandatory of the "Halo" cockpit protection device. Its introduction was pushed through by the governing body - on safety grounds rather than through a standard vote.